Bryant (knee, suspension) may have a chance to be reinstated before training camp if he follows his treatment plan during the offseason, Tom Pelissero of NFL.com reports. Bryant (knee) has been has been returned to the NFL's Reserve/Commissioner Suspended list indefinitely under the league's Policy and Program for Substances of Abuse. Analysis: Per the report, Bryant, who already was on IR due to a knee injury, is back on the list after violating the terms of his April 2017 conditional reinstatement. The wideout's contract with the Raiders expires after the current season, with this latest news clouding his playing future, even when he's healthy enough to take the field. The Raiders will place Bryant (knee) on injured reserve Wednesday, Matt Schneidman of The San Jose Mercury News reports. Coach Jon Gruden said Monday that he doesn't know when Bryant (knee) will be healthy enough to play, Vic Tafur of The Athletic reports. Analysis: Bryant has missed three games in a row due to a PCL injury in his left knee. Until he makes an appearance in practice, it'll be difficult to forecast when the wide receiver may start to inch toward a return. In Bryant's absence, Marcell Ateman has stepped into a larger role alongside Jordy Nelson and Seth Roberts. Bryant (knee) is inactive for Sunday's game against the Chiefs. Analysis: This is no surprise after the wideout was downgraded to doubtful Saturday, but the fact the Bryant was initially listed as questionable suggests that he has a chance to return to action in Week 14 against the Steelers. On Sunday, the Raiders' receiving corps will be led by Jordy Nelson, Marcell Ateman and Seth Roberts. Bryant (knee) was downgraded to doubtful for Sunday's contest against the Chiefs, Michael Gehlken of the Las Vegas Review-Journal reports. Analysis: It seemed unlikely Bryant would take the field Sunday given the 26-year-old failed to practice all week, and the downgrade seems to confirm those suspicions. Should Bryant get ruled out, the likes of Seth Roberts and Marcell Ateman will continue to fill in behind Jordy Nelson for a thin Raiders receiving core. Bryant (knee) is listed as questionable for Sunday's game against the Chiefs, Paul Gutierrez of ESPN.com reports. 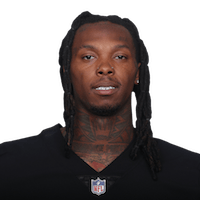 While Bryant (knee) won't be available for Sunday's game against the Chiefs, offensive coordinator Greg Olson said he expects the wideout to play again this season, Scott Bair of NBC Sports Bay Area reports. Coach Jon Gruden said Bryant (knee) will be out for at least a couple games and possibly longer, Michael Gehlken of the Las Vegas Review-Journal reports. Analysis: Gruden seems to be hinting at the possibility of Bryant's PCL injury being of the season-ending variety. As far as the immediate future goes, Oakland may need to rely on Brandon LaFell, Seth Roberts and Marcell Ateman in Sunday's game against the Chargers, as veteran wideout Jordy Nelson (knee) is in danger of joining Bryant on the inactive list. It's possible Bryant has played his last game as a member of the Raiders with his contract set to expire at the end of this season. Bryant (knee) will miss some time with a PCL injury, Matt Schneidman of The San Jose Mercury News reports. Analysis: An MRI on Monday confirmed initial fears of a significant PCL injury, ruling Bryant out for Week 11 at the least. It isn't actually a major blow to the Oakland offense, as the mercurial wideout hasn't seen more than three targets in a game since Week 4. With Jordy Nelson also suffering a knee injury Sunday, the Raiders may be left with Brandon LaFell, Seth Roberts and Marcell Ateman as their top options at wide receiver for Week 11 at Arizona. Bryant injured the PCL in his left knee during Sunday's loss to the Chargers and will have an MRI on Monday to determine the ailment's severity, Michael Gehlken of the Las Vegas Review-Journal reports. Analysis: Bryant's knee issue is something coach Jon Gruden said the Raiders are "really concerned" about. While that casts a cloud over his situation, Monday's testing should produce a more definitive update on his outlook. Prior to exiting Sunday's game, Bryant caught all three of his targets for 17 yards. Bryant was forced out of Sunday's game against the Chargers with a knee injury. Analysis: Prior to his exit from the contest, Bryant caught all three of his targets for 17 yards. For now, we'll consider him day-to-day as Week 11's contest against the Cardinals approaches. 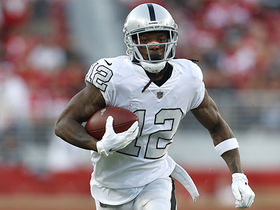 Bryant caught both of his targets for 29 yards and rushed for 17 yards on one carry in the Raiders' 34-3 loss to the 49ers on Thursday night. Analysis: Bryant saw a slight uptick in involvement after barely seeing the field in a Week 8 loss to the Colts, but he remains behind Jordy Nelson, Brandon LaFell and Seth Roberts in the pecking order at wide receiver. Bryant has caught no more than two passes in three consecutive games, so his outlook for Sunday's tilt against the Chargers isn't too positive. Bryant played seven snaps and didn't draw a target in Sunday's 42-28 loss to the Colts. Analysis: Bryant was deployed as the No. 4 wide receiver in Oakland's first game without Amari Cooper, logging far fewer snaps than Brandon LaFell (92 percent), Jordy Nelson (90 percent) and Seth Roberts (60 percent). It would make sense for a rebuilding team to eventually give Bryant more opportunities, but we can't count on that happening in Thursday's game against the 49ers. Bryant is expected to start at wide receiver across from Jordy Nelson in Week 8 against the Colts following Oakland's Monday trade of Amari Cooper. 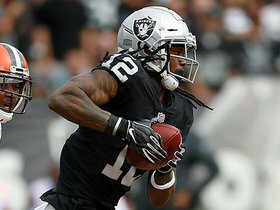 Bryant caught two of three targets for 18 yards during the Raiders' 27-3 defeat at the hands of the Seahawks on Sunday. Analysis: Bryant is a low-volume asset for Oakland, averaging 4.4 targets per game and only exceeding 55 receiving yards once in five appearances. The clearly gifted, but so far underproducing, Bryant may manufacture some buzz as a midseason fill-in option, with potential for an explosive output against the Colts' No. 28 pass defense in Week 8 after the bye and a matchup with a mostly young and unproven San Francisco secondary in Week 9. Bryant (illness) is listed as active for Sunday's game against the Seahawks. Analysis: Bryant hasn't found the end zone in his first four games this season, but he has hauled in a combined six passes (on 10 targets) for 142 yards over his last two outings and continues to provide the Raiders with a big-play threat behind starting wideouts Amari Cooper and Jordy Nelson. Bryant was a late addition to the injury report as questionable ahead of Sunday's game against the Seahawks due to an illness, James Palmer of NFL Network reports. Bryant caught each of his three targets for a team-high 91 yards in Sunday's 26-10 loss to the Chargers. Bryant hauled in three of seven targets for 51 yards in Sunday's 45-42 overtime win over the Browns. Bryant caught two of five targets for 30 yards and ran for four yards on one carry in Sunday's 28-20 loss to the Dolphins. 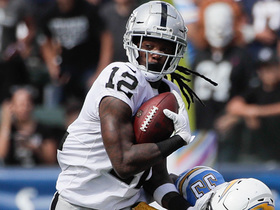 Analysis: Bryant has now accounted for 30 receiving yards in each of his first two games with the Raiders, but his six yards per target Week 3 came as a bit of a disappointment while Jordy Nelson exploded for 173 yards and a score on six catches. Bryant will continue to build his rapport with quarterback Derek Carr as the 0-3 Raiders look to add a tally in the win column against the Browns in Week 4. Bryant caught all four of his targets for 30 yards in Sunday's 20-19 loss to Denver. 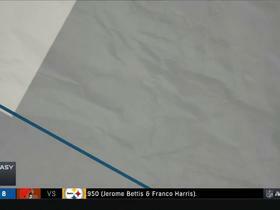 Analysis: Bryant made a 16-yard catch at the start of the second quarter that would end up as his big gain of the day. Still, the four targets were good for a share of second on the team with Jordy Nelson and Jared Cook. The Clemson product likely will depend on long plays in order to make an impact and therefore be a high-risk, high-reward option Week 3 at Miami. Bryant will be allowed to play for the Raiders until a verdict is rendered regarding his appeal of a year-long suspension from the NFL, Adam Schefter of ESPN reports. Raiders head coach Jon Gruden said Wednesday that Bryant is healthy and should be ready to play Sunday in Denver, Michael Gehlken of the Las Vegas Review-Journal reports. Analysis: Gruden declined to comment on rumors of an impending suspension for Bryant, something that likely played a big role in the decision to release the wideout at the end of the preseason. The Raiders re-signed the 26-year-old Tuesday, perhaps hoping he can provide a downfield threat while he gets the potential suspension sorted out with the league. Assuming Gruden elects to make him active in Week 2, Bryant may be limited to a small role as the team's fourth or fifth wideout. Bryant signed a one-year contract with the Raiders on Tuesday, Dan Graziano of ESPN.com reports. Analysis: Bryant was initially released by Oakland prior to roster cutdowns, due to concerns about an imminent suspension -- but Bill Williamson of RaidersSnakepit.com reports that "no suspension is official." Bryant is additionally expected to suit up against the Broncos on Sunday, as reported by Tom Pelissero of NFL.com. It's an unexpected turn of events, but all signs point toward Bryant taking the field alongside Amari Cooper and Jordy Nelson during Week 2. Bryant signed a contract with the Raiders on Tuesday, Dan Graziano of ESPN.com reports. Analysis: It was earlier reported that Bryant was visiting with the Raiders, and it appears that there was little to discuss. The 26-year-old will re-join the team after being released Sept. 1. It's unclear if a one-year suspension for allegedly violating the NFL's substance-abuse policy is still in play. He's expected to play Week 2 against the Broncos, Tom Pelissero of NFL.com reports. Bryant will add a much-needed deep presence to the Raiders' passing attack. Bryant is visiting with the Raiders on Tuesday, Mike Garafolo of NFL Network reports. Bryant could face a year-long suspension for his latest violation of the NFL's substance-abuse policy, a source informed Adam Schefter of ESPN. Bryant was released by the Raiders on Saturday, Ian Rapoport of NFL Network reports. Analysis: With Bryant reportedly facing another suspension for a violation of the NFL's substance abuse policy, the Raiders decided to cut ties four months after they traded a third-round pick to acquire him. It also sounds like the 26-year-old wideout plans to appeal what figures to be an indefinite suspension. The Raiders will move forward with Seth Roberts as their No. 3 wide receiver behind Amari Cooper and Jordy Nelson. The Raiders are planning to release Bryant, Dan Graziano of ESPN.com reports. Analysis: Bryant reportedly has a pending appeal of a drug suspension from the NFL. Given his lengthy history in the league's substance abuse program, any kind of infraction could lead to an indefinite ban. It doesn't help that Bryant struggled throughout training camp and the preseason, with multiple reports suggesting he had a hard time learning Jon Gruden's offense. The Raiders appear to have flushed a third-down pick down the drain with their April trade for the 26-year-old wideout. Bryant caught one of two targets for 14 yards in Friday's preseason game against Green Bay. Analysis: Both of his targets came in the first quarter, but Bryant stayed in the contest far beyond that, ultimately logging the third-most snaps (28) among Oakland wideouts. Meanwhile, Amari Cooper and Jordy Nelson combined for only 11 snaps, both coming out of the game after the opening drive. Bryant likely will open the season as Oakland's No. 3 receiver in a Week 1 game against the Rams. Bryant won't take the field Saturday versus the Rams, Michael Gehlken of the Las Vegas Review-Journal reports. Analysis: Bryant was absent from drills most of the last week due to what was termed "really bad migraines," according to Vic Tafur of The Athletic Bay Area. Although he returned to drills Wednesday, Bryant is among a number of Raiders starts to get the day off Saturday. Expect Bryant to earn his busiest preseason run Friday against the Packers as the Raiders ramp up for the regular season. Bryant (head) returned to practice Wednesday, Matt Kawahara of the San Francisco Chronicle reports. Analysis: Bryant was held out of practice Monday and Tuesday while dealing with migraines, a condition he has been bothered by for years. He also missed one practice with an unspecified illness early in training camp, but he has otherwise been healthy since joining the Raiders in April. The 26-year-old likely will enter Week 1 as the team's No. 3 receiver, as his issues with learning the Oakland playbook seem to have prevented him from pushing Jordy Nelson for the No. 2 job. Bryant is dealing with what are being described as "really bad migraines," Vic Tafur of The Athletic Bay Area reports. Analysis: The wideout has now missed two straight practices with his migraines, which the report relays is a condition that he has contended with for years. For now, consider Bryant day-to-day and not subject to the NFL's concussion protocol. Bryant (illness) isn't practicing Tuesday, Michael Gehlken of the Las Vegas Review-Journal reports. Analysis: Bryant missed practice Aug. 1 due to an unspecified illness and was held out of Monday's session while dealing with headaches. He's otherwise been healthy since joining the Raiders in April, but the missed time won't help his struggles learning the Oakland playbook. Bryant caught one pass for 18 yards in the preseason opener, and he still has a few days to recover before Saturday's exhibition game against the Rams. Bryant missed Monday's practice due to a headache, Matt Kawahara of The San Francisco Chronicle reports. Bryant (undisclosed) isn't practicing Monday, Michael Gehlken of the Las Vegas Review-Journal reports. 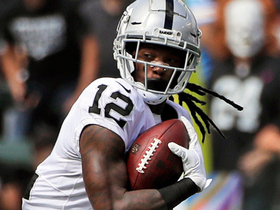 Bryant made his Raiders debut during Friday's preseason opener against the Lions and caught one pass for 18 yards. Bryant is struggling to grasp the Oakland playbook during training camp, despite being limited to one spot in the offense, according to James Jones of NFL Network. Bryant (illness) returned to practice Thursday, Michael Gehlken of the Las Vegas Review-Journal reports. Analysis: Though reports surfaced in June suggesting that Bryant may be facing a suspension for an unspecified infraction, there's been no word on that front to date. 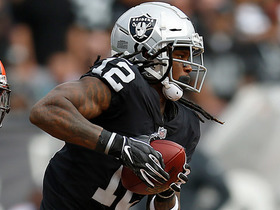 The 26-year-old will thus look to cement a role in the Raiders offense behind Amari Cooper and Jordy Nelson, though even if he ends up being the team's No. 3 wideout option, Bryant's speed and 6-foot-4, 210-pound frame make him an effective big play/deep threat weapon when he's both available and focused. Bryant was held out of Wednesday's practice while recovering from an illness, Michael Gehlken of the Las Vegas Review-Journal reports. As Bryant prepares to report for training camp, there has been no news regarding any potential suspension that he may face, Herbie Teope of NFL.com reports. Analysis: Reports surfaced in June suggesting that the wideout may be facing a suspension for an unspecified infraction, but so far there's been no word on that front. With the Raiders, Bryant presumably slots in behind both Amari Cooper and Jordy Nelson, but when available and focused, the 6-foot-4, 210-pounder can be an effective big play/deep threat weapon. The Raiders fear Bryant may be the subject of NFL discipline and are awaiting final word on the situation, which they believe to involve the league's substance-abuse policy, Michael Gehlken of the Las Vegas Review-Journal reports. Bryant has been traded to the Raiders in exchange for Oakland's third-round pick in the 2018 NFL Draft. Bryant is drawing interest from other teams, but Steelers general manage Kevin Colbert said the organization isn't interested in trading the wide receiver, Dale Lolley of DKPittsburghSports.com reports. Bryant caught two of his four targets for 78 yards and a touchdown in Sunday's 45-42 AFC divisional-round loss to Jacksonville. Bryant, who caught six passes (on seven targets) for 65 yards in Sunday's 28-24 win over the Browns, finishes up the 2017 season with 50 catches (on 84 targets) for 603 yards and three touchdowns. He also ran six times for 22 yards and added 151 yards on nine kick returns in 15 games. Bryant caught three of four targets for 60 yards and added an eight-yard rush in Monday's 34-6 win over Houston. Analysis: Even with Antonio Brown (calf) sidelined, Bryant didn't see nearly as much attention from Ben Roethlisberger as Le'Veon Bell (eight targets) or JuJu Smith-Schuster (seven targets). The mercurial wideout's big-play ability gives him a high ceiling for next week's finale against the mistake-prone Browns, but Bryant's inconsistency also gives him a low floor. Bryant will take on an expanded role over the final two weeks of the regular season with Antonio Brown (calf) out of the lineup, ESPN.com's Jeremy Fowler reports. Bryant brought in four of six targets for 59 yards and a touchdown in Sunday's 27-24 loss to the Patriots. Analysis: Bryant capped an impressive 15-play, 78-yard drive in the closing seconds of the first half with a four-yard touchdown reception, his second of the season. The third-year wideout has now posted at least four catches in four consecutive weeks, and although his 11.3 YPC is a far cry from the 21.1 and 15.3 figures he'd posted over his first pair of NFL campaigns, Bryant could be the beneficiary of an expanded Week 16 role versus the Texans if Antonio Brown (calf) misses the contest. Bryant (not injury related) practiced in full Thursday. Analysis: Bryant will be fine for Sunday's game against the Patriots, though his Week 15 fantasy upside hinges on the status of JuJu Smith-Schuster, who was set to return from a one-game suspension this week, but subsequently added to the Steelers' injury report Thursday after practicing in a limited fashion due to a hamstring injury. Bryant (not injury-related) did not practice Wednesday. Analysis: Per Jeremy Fowler of ESPN.com, Bryant had a personal situation to tend to and will return to the team Thursday. Bryant was on the field for 80 percent of the Steelers' snaps on offense in this past Sunday's 39-38 win over the Ravens, en route to catching six passes (on 10 targets) for 33 yards, though JuJu Smith-Schuster, who's returning from a one-game suspension, could eat into Bryant's workload. Bryant caught 6-of-10 targets for 33 yards in Pittsburgh's 39-38 win over Baltimore on Sunday. Analysis: With JuJu Smith-Schuster serving a one-game suspension, Bryant saw more targets than in any game this season, but was unable to do much with them. With Smith-Schuster returning in Week 15, Bryant will likely see his role reduced, making him an unappealing option for fantasy owners. Bryant caught four of six targets for 40 yards in Pittsburgh's 23-20 win over Cincinnati on Monday. Analysis: Bryant matched his stat line from Week 12, sans a touchdown, although he did have a 96-yard kickoff return for a touchdown called back due to a holding penalty. With JuJu Smith-Schuster facing a possible suspension for an illegal hit on Cincinnati linebacker Vontaze Burfict, Bryant could be in line for a bigger role in Week 14 against Baltimore. Bryant caught four passes for 40 yards and a touchdown in Pittsburgh's 31-28 win over Green Bay Sunday night. He also ran once for one yard. Analysis: With JuJu Smith-Schuster (ankle) inactive, Bryant saw his most targets (six) since Week 5, and scored his second touchdown this season. His role in the offense could continue to grow if Smith-Schuster is unable to play against Cincinnati in Week 13 but, even then, he is not someone owners should be counting on with fantasy playoffs on the horizon. Bryant should see an increased role in the Steelers' passing attack Sunday against the Packers due to the absence of JuJu Smith-Schuster (hamstring). Analysis: Smith-Schuster was unable to recover from a "small" hamstring injury, despite the benefit of 10 days between games. In his four starts early in the season, Bryant racked up 10 receptions (on 21 targets) for 81 yards. That said, he's been a bit more efficient over the last two games, reeling in five of nine passes for 72 yards. Bryant totaled 30 yards on two receptions in Thursday's 40-17 win over the Titans. Bryant (illness) does not carry a designation on the Steelers' Week 11 injury report after being listed as a full practice participant Wednesday. Analysis: Bryant is thus slated to be available for Thursday night's game against the Titans. Due to his potential to make a splash as a vertical threat in the Pittsburgh offense, he's an option in deeper fantasy formats, though at this stage, fellow wideouts Antonio Brown and JuJu Smith-Schuster are high-percentage lineup options. Bryant parlayed 37 (out of a possible 66) snaps in Week 10's win over the Colts into three catches (on five targets) for 42 yards, while adding a two-point conversion. Bryant missed Tuesday's practice due to an illness. Bryant brought in three of five targets for 42 yards and lost nine yards on his sole rush in Sunday's 20-17 win over the Colts. He also caught a two-point conversion pass. Steelers coach Mike Tomlin said Bryant will play in Sunday's game against the Colts, hinting that the wideout's return could help the team create more big plays, Gerry Dulac of The Pittsburgh Tribune-Review reports. Steelers head coach Mike Tomlin confirmed Tuesday that Bryant would likely play Sunday against the Colts, Ed Bouchette of the Pittsburgh Post-Gazette reports. Bryant took reps with the first-team offense Monday in the Steelers' first practice coming out of their Week 9 bye, Joe Rutter of the Pittsburgh Tribune-Review reports. "I'm pretty sure I'm going to be out there," Bryant said, regarding his availability for Sunday's game against the Colts. "It's a long week. It's only Monday. I'll come back in here Wednesday, get the game plan and go from there." 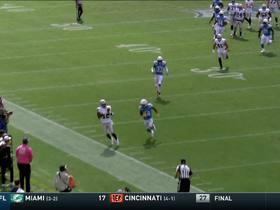 Oakland Raiders wide receiver Martavis Bryant bursts into the red zone with a powerful 17-yard run. NFL Network's Adam Rank and Marcas Grant discuss if different players across the league will board the "Hype Train". 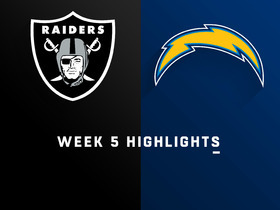 Watch the highlights from the Oakland Raiders facing off against the Los Angeles Chargers in Week 5 of the 2018 NFL season. Oakland Raiders quarterback Derek Carr slings a deep pass to his wide receiver Martavis Bryant for 47 yards. The Los Angeles Chargers recover Oakland Raiders wide receiver Martavis Bryant's fumble in the open field. Oakland Raiders wide receiver Martavis Bryant pulls in an over-the-shoulder catch for 23 yards on a pass from quarterback Derek Carr. Oakland Raiders quarterback Derek Carr zips a pass to wide receiver Martavis Bryant for 28 yards. 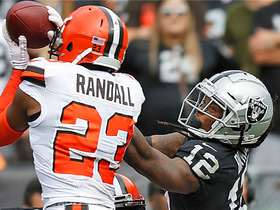 Cleveland Browns safety Damarious Randall picks off Oakland Raiders quarterback Derek Carr on a perfect read. Oakland Raiders wide receiver Martavis Bryant accelerates for a 26-yard gain on a slant play from quarterback Derek Carr. Oakland Raiders wide receiver Martavis Bryant drops a wide-open pass near the end zone.